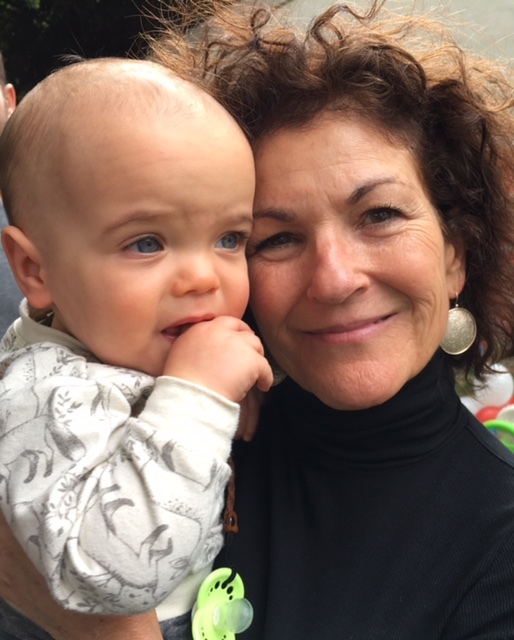 I have been reflecting on the awesome responsibility of being a grandmother. It has been a transition to say the least. And with all transitions there is an adjustment period and an awkward sense of the unknown as well as the anticipation of what is to come and how it will all look once everyone finds their sea legs. My gracious son and daughter in law let me choose the name I would like to be called by little Boe and it was a quick decision. Like my Sittis before me, I felt that the Arabic name for grandmother was more than appropriate because it speaks of a long history of Lebanese women who wanted nothing more than to cook, feed, and make a cozy home for their families. And even though I had the means and awareness to get a college degree and beyond and have a thriving and rewarding career, I have to admit my first goal when I stepped onto a college campus at 17 years old was to get my MRS degree, have a family, and create a loving home for them. I was named after my maternal Sitti, Rosa Maloof, and of course like all good Catholic girls, the Blessed Virgin Mary. (My parents must have had high aspirations for me!) I had to do some fact checking with my brothers and as my memory serves me, I only saw my maternal grandmother three times in my entire life. She and my grandfather lived in Atlanta and were not fond of flying. We were a family of eight in California and traveling across the country to see our grandparents was a bit out of the budget. I was able to spend time with them once as a little girl, once as a teenager, and much later when I was 30. When my mother passed away at 61 years old, they did not come out for her funeral. It is still incredulous to me today. I would move heaven and earth to see my children in any state (or state). My father’s mother, Louise, died in childbirth along with her fifth child. My dad was the oldest and we think (our collective memories) he was about 6 years old when she died. The baby’s name was John and I remember my dad telling me the story- never with a straight face- always with tears running down his cheeks. My brother John was named after my dad’s little brother. My grandfather sent for a wife from Lebanon (cousins.. can you do some fact checking for me? This is part urban legend passed down through oral history). Her name was Madeleine and she had to quickly adjust to a new country, a new husband, and to my grandfather Thomas’ four children. They went on to have four more children of their own whom my grandmother favored. And she favored their children as well. With that said, I must confess that I don’t remember having a Sitti who wanted to kiss me and hold me, babysit me and get on the floor and play with me and/or agonize over the next time she might be able to spend time with me. I write all this not so that you will feel sorry for me. I write it for my own understanding and for my children’s understanding. I write it to rub a salve on a wound that has just recently been exposed as I reflect on my own experience as a grandmother. I write it to help me understand this longing in my heart to be near my new grandson and be a part of his life. I write it because I know I am not alone in this reflection and confession and to open a conversation about the role of a grandmother in a child’s life. In the song Both Sides Now Joni Mitchell sings “Something’s lost and something’s gained in living every day.” Life is not always easy. Family is not always as Norman Rockwell would illustrate but I believe people try. In the absence of holding me and reading stories to me, my Sittis cooked and cleaned and fed me and I suppose they thought that was enough. But this Sitti wants something different with her grandchildren. I would love to hear your thoughts on being a grandparent.